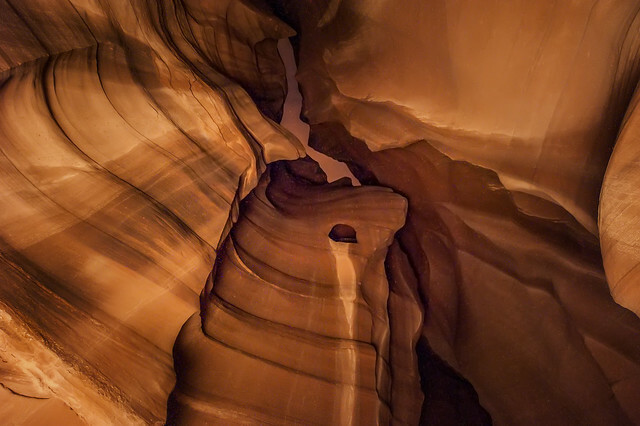 My recent visit to Upper Antelope Canyon in Page, Arizona definitely falls into the “not likely to be repeated any time soon” category. First, the canyon is not within a two hour drive of any major metropolis. 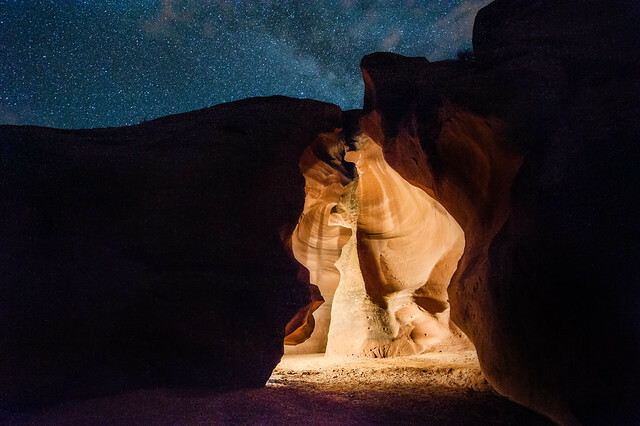 Furthermore, as the attraction is located on Navajo land, visiting the canyon requires hiring a Navajo guided tour. 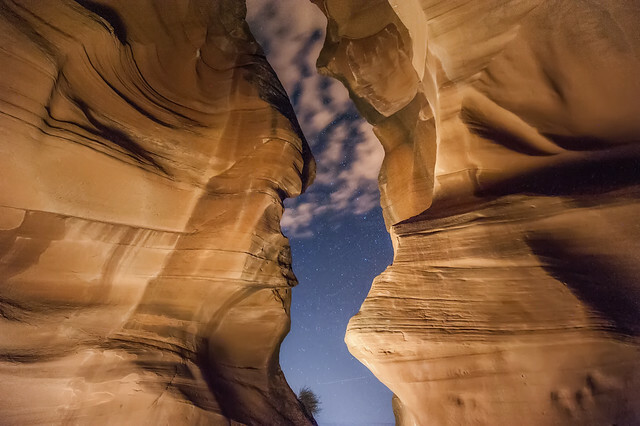 On top of all that, all but one of these guided tours are during the daytime, so visiting the canyon in the middle of the night, during a new moon with minimal cloud coverage, in the prime star-viewing season of the year would be a difficult experience to repeat. 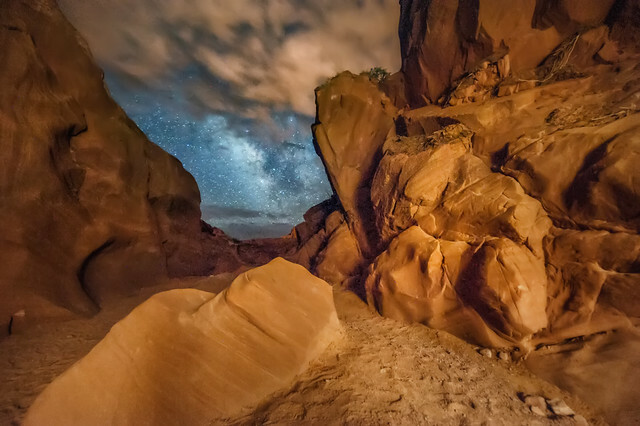 Despite having reserved my place in the night photography tour, the tour company advises all of its clients that the tour is far from guaranteed, as a cloudy evening would render the stars invisible and that night’s tour cancelled. Arizona’s monsoon season had just begun when I arrived a few days earlier, and my odds at a clear sky seemed pretty bleak that night. I pulled up to an empty parking lot at the tour company’s tent at 8:45pm sharp, navajo time. 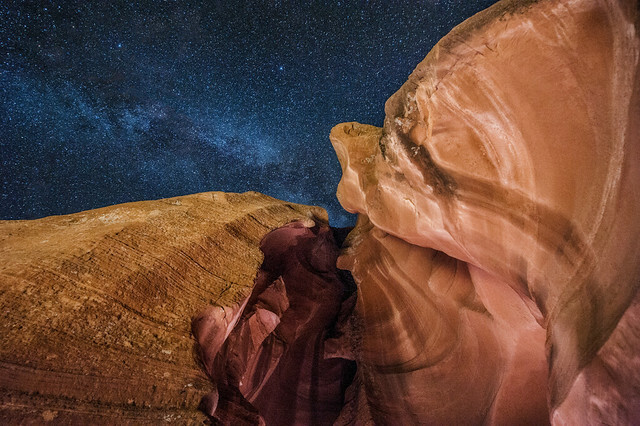 Despite the fact that the town of Page and the surrounding Navajo territory both reside in Arizona, the Navajo use daylight savings time while the rest of the state does not. Knowing this, all hope was not lost given the empty parking lot of the tour group, and sure enough, a clock mounted to the wall of the tent indicated 7:45pm and that this tour group actually used arizona time. I drove around for a bit, returning an hour later, this time, the lights of a pickup truck parked in the lot indicated that this tour was happening after all. I met my guide, Roman (@spiritualseeker2015), hopped into his truck, and a bumpy, ten minute ride to the mouth of the canyon began. I wasn’t totally shocked that I would be the only guest on this tour as the time and remoteness of this location meant that anyone participating in this tour staying at a nearby mid-sized city wouldn’t make it back until after 2am. 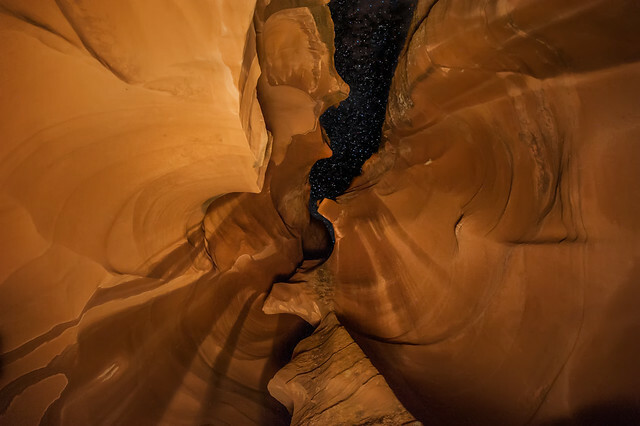 My experience at Antelope Canyon was the complete opposite of the experience that I described at Horseshoe Bend. The entrance wasn’t near the highway, there was no parking lot, signs, or tourists in sight. With no warning, the bumpy ride stopped and we were at the mouth of the canyon. 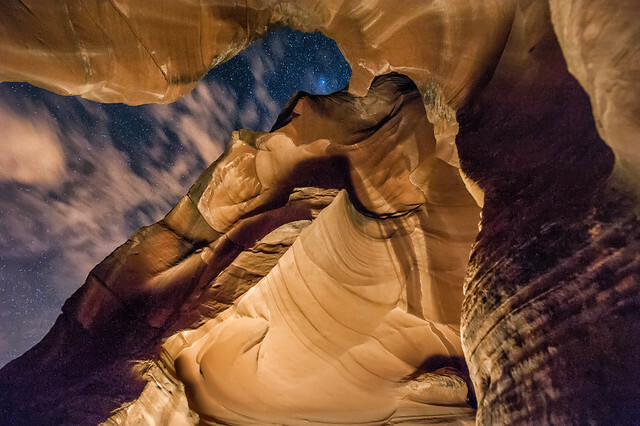 The exact age of the canyon is unknown with some experts guessing the order of magnitude in the millions of years while others suggest thousands as a more likely estimate. 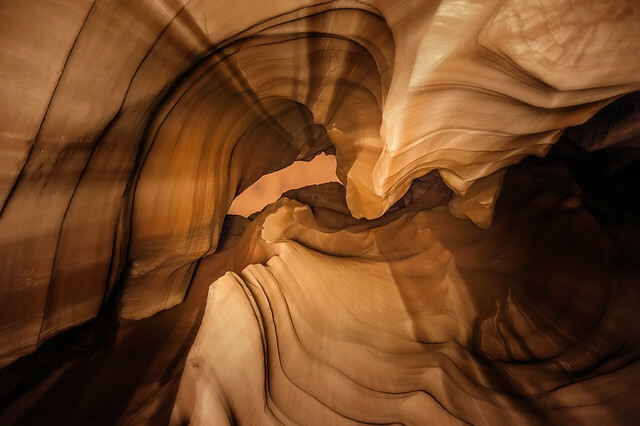 The canyon was created by the erosion of sandstone primarily due to flash floods which continue to run through the canyon’s walls. It is because of this flooding that the attraction requires a guided tour to visit. 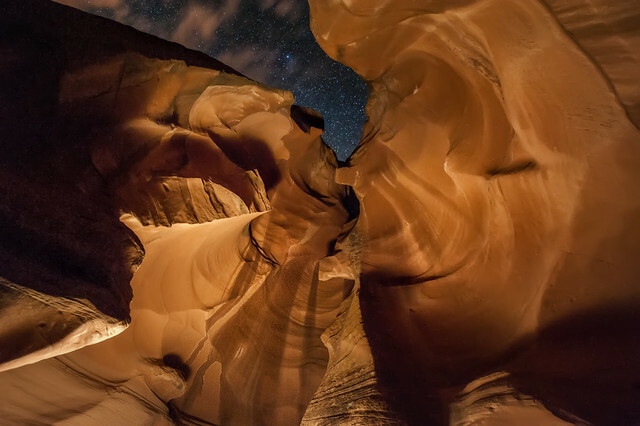 Using an LED light provided by Roman, we illuminated the canyon walls while I took long exposures to capture the canyons majestic curves with the starry night sky. The tour lasted about two hours long with me having free reign of the entire canyon. The width of the Canyon varies as you walk through it, sometimes getting as narrow as just a couple of feet, luckily I'm not claustrophobic. The lines in the rock are incredibly smooth from rainwater erosion, slowly making its mark over time. A notch in the upper wall of the canyon makes home for one of the many bats that were flying through cave at this late hour. 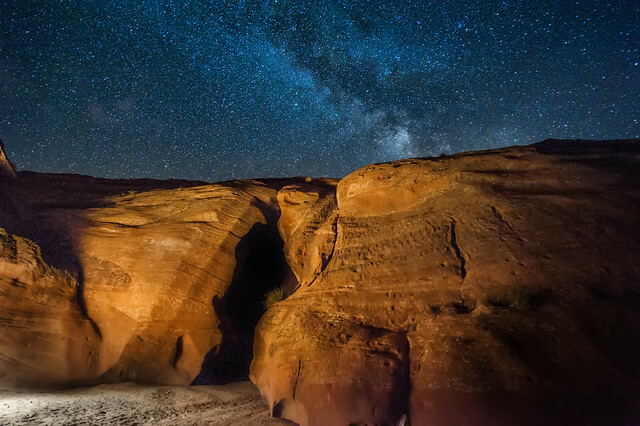 As we made our way to the back of the canyon, we had an amazing view of the stars. Lighting the walls with the LED wasn't a perfect science. I fixed my settings to properly expose the stars without movement, and did my best to position the light to shine just the right amount of light across the walls. At 15mm, a 30 second exposure was enough to capture some cloud movement but keep the stars relatively fixed in the frame. While the photos appear well lit, it was extremely dark in the canyon and with each shot I checked the LCD screen on my camera hoping I made a decent composition. I tried something different with this shot, choosing to light the interior of the canyon while leaving its outer walls underexposed. As the tour was coming to an end, the sky was completely dark with a sky covered in stars. This shot took a few tries as an evenly lit canyon required that I first paint the outer walls with the LED, then scurry inside to paint the cave's interior all within the 30 second exposure. Professionally shots are taken amazing nature beauty lies in every shoot. visit My Site.